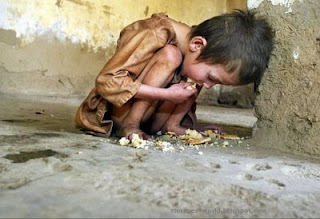 This is one more reason why we have to thank God for the food that we can have easily. 'I felt very fortunate to live in this part of the world. I promise I will never waste my food no matter how bad it can taste and how full I may be. I promise not to waste water. I pray that this little boy be alleviated from his suffering. I pray that we will be more sensitive towards the suffering in the world around us and not be blinded by our own selfish nature and interests. 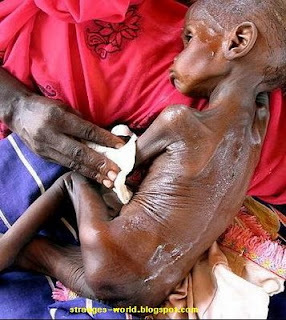 I hope this picture will always serve as a reminder to us about how fortunate we are and that we must never ever take things for granted. 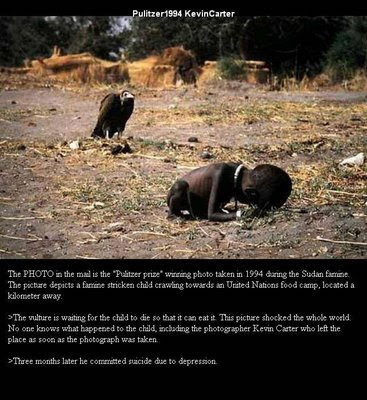 Think & look at this...when you complain about your food and the food we waste daily...' MAY ALL HUMAN BEINGS BE FREE FROM SUFFERING!!!! Please don't break this, keep on forwarding it to all our friends. On this good day, let's make a prayer for the suffering in any place around the globe and send this friendly reminder to others. MY GREAT FRIENDS, DON'T BREAK THIS CHAIN, KINDLY SEND IT TO SOMEONE YOU LOVE, TO ENABLE HIM OR HER SEE WHAT GOD HAS DONE IN HIS/HER LIFE COMPARED WITH THESE KIDS' DEPLORABLE CONDITIONS.